Unsuccessful hatches can be caused by infertile eggs or embryo mortality. Each of these conditions can be diagnosed by Candling Eggs. (Please also consider this alternative method to check for embryo mortality.) It is important to examine eggs that do not hatch to estimate whether infertility or embryo death is the basis for hatch failure. 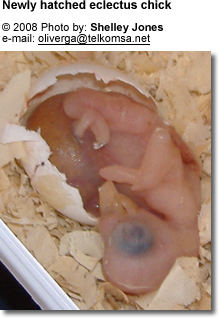 within the first 3 days of incubation - early embryo death occurs during formation of embryonic organs. within the last 3 days immediately before a hatch. Contaminated by hands as eggs are handled (turned or candled). Poorly maintained incubator - incubators need to be disinfected and cleaned thoroughly before adding eggs. Dead or infertile eggs that are spoiling and are left inside the incubator in close proximity with viable eggs. Hatchability requires certain humidity and temperature levels. Please follow the instructions of the incubator that you are working with. Death immediately before a hatch occurs during the transition between living in an egg to living on the outside. The chick can have difficulty positioning for pipping, absorbing the yolk sac, or changing to breathing air. Sometimes humidity control can be implicated. Special Note about Duck / Goose Eggs: Dave Holderread in his book, 'Storey's Guide to RAISING DUCKS" recommends that duck / goose eggs be sprayed or sprinkled with warm water to prevent the egg membranes from drying out and becoming tough during the hatch (potentially resulting in "dead-in-shells). He recommends spraying or sprinkling these eggs with warm water (about 100 degree Fahrenheit) once each day from day 4 to 26. In nature, the hen will get off the eggs and into the water at least once a day to feed and drink. She will then return to the nest and continue to brood the eggs with her wet plumage - naturally wetting down the eggs. Hypercalcaemia (elevated calcium levels): Excess calcium causes the eggshell to harden making it difficult to impossible for chicks to hatch. Unless they are assisted, they will die. Considerably incorrect incubator settings either through malfunction or incorrect settings - hatching temperature and humidity should be different from the incubation temperature and humidity. The change should be made anywhere from a week to three days prior to the expected hatch date (basic incubators need to manually adjusted, while the more sophisticated models can be set to make changes automatically). Humidity: If the humidity is too high the chick could drown inside the air cell. If the chick does survive, the hatching chick looks swollen and too big for the shell - that is indication that the humidity was too high throughout the incubation period, and the chick did not lose enough weight during incubation. Even if the humidity was too high during incubation, the chick will still need maximum humidity for hatching. If the humidity is to dry, the chicks get "shrink-wrapped" by the membrane, which dries out and turns sticky - preventing the chicks from rotating in the shell. If the humidity is too low during any part of the incubation period, this can result in chick death at any stage of its development. Temperature: One temperature spike is unlikely to kill a developing chick. It takes more than a few minutes at a higher temperature than normal before a chick is killed. If you had other eggs in the incubator that hatched with the egg that didn't, this problem can probably be ruled out (although some basic incubators may have "hot spots" or "cool spots" -- depending on air circulation inside the incubator. If the chick hatches very early - that is indication that the temperature was too high during incubation. If the chick is hatching too late, that is a sign that the temperature was too low or the egg got chilled during incubation. 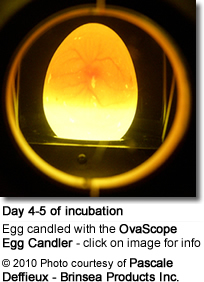 Egg Turning: During the incubation period, eggs need to be turned several times a day. However, the last 3 days before hatching, the chick is fully formed and, at this stage, is in the process of absorbing egg yolk into the abdomen (for nutrition). If the handler continues to turn the egg at this stage, the yolk sac can become twisted potentially preventing absorption of the yolk and starvation or at least weakening of the chick. Also, breaking out will be more difficult if the yolk contents have not been absorbed. If the egg has been turned like all the other eggs, then turning can also be ruled out. Calcium Surplus: Too much calcium in the mother hen's diet can result in thick-shelled egg shells, which will prevent chicks from hatching. Generally one can tell if there is too much calcium, if the egg shell isn't smooth. One can see irregular bumps on the surface. Over handling of the eggs: Skin oils prevent oxygen from getting into the egg resulting in suffocation of the chick, as the oil blocks the pores. One way to tell if this is the problem is if the surface of the eggs looks glossy. Lethal Gene: Some breeds carry "lethal" genes, particularly if related birds are bred. Infection: Either the incubator is contaminated or the egg itself was contaminated outside. Darkening around the yolk sack and a foul smell would support an infection. Chick death can occur during the incubation or even several days after hatching. Vitamin D: Death at about 18 or 19 days of incubation, with malpositions, soft bones, and with a defectiveupper beak prominent. Vitamin E: Early death at about 84 to 96 hours of incubation, with hemorrhaging and circulatory failure(implicated with selenium). Thiamin: High embryonic mortality during emergence but no obvious symptoms other than polyneuritis inthose that survive. Riboflavin (Vitamin B2): Mortality peaks at 60 hours, 14 days, and 20 days of incubation, with peaks prominent early asdeficiency becomes severe. Altered limb and beak development, dwarfism and clubbing ofdown are defects expressed by embryo. Niacin: Embryo readily synthesizes sufficient niacin from tryptophan. Various bone and beak malformationsoccur when certain antagonists are administered during incubation. Biotin: High death rate at 19 days to 21 days of incubation, parrot beak, chondrodystrophy, severalskeletal deformities and webbing between the toes. Perosis. Pantothenic acid: Deaths appear around 14 days of incubation, although marginal levels may delay problems untilemergence. Variable subcutaneous hemorrhaging and edema; wirey down in poults. Pyridoxine: Early embryonic mortality based on antivitamin use. Folic acid: Mortality at about 20 days of incubation. The dead generally appear normal, but many havebent tibiotarsus (long leg bone), syndactyly (fused toes) and beak malformations. In poults, mortality at 26 days to 28days of incubation with abnormalities of extremities and circulatory system. Vitamin B12 : Mortality at about 20 days of incubation, with atrophy of legs, edema, hemorrhaging, fattyorgans, and head between thighs malposition. Manganese : Deaths peak prior to emergence. Chondrodystrophy, dwarfism, long bone shortening, headmalformations, edema, and abnormal feathering are prominent. Perosis. Zinc: Deaths prior to emergence, and the appearance of rumplessness, depletion of vertebral column,eyes underdeveloped and limbs missing. Iodine : Prolongation of hatching time, reduced thyroid size, and incomplete abdominal closure. Iron: Low hematocrit; low blood hemoglobin; poor extra-embryonic circulation in candled eggs. Kate Ison offers an "easier and less intrusive way to find out if the embryo in a cold and neglected egg is dead or alive:"
IMPORTANT: Warm the egg to brooder temperature first. As long as you are sure the egg hasn't pipped externally (if it has just pipped internally it wont harm it). Gently place the egg in a small but deep bowl of water at 100 F for up to 20 seconds. Note: Any significant temperature change the egg is exposed to is likely to hurt the developing chick. Therefore, the temperature of the water is very important! If the embryo is still alive the egg will bob up and down and generally wobble around, take it out and dry it on a tissue or the chick could become chilled, put it back in the brooder. It will not harm the chick and may in some cases help a chick in trouble to eventually get out. It causes no shock to an embryo and presents no danger of the chick bleeding to death or becoming dehydrated or infected as it sits in an open egg waiting for the blood vessels to recede.